March 7, 2011 – Monthly G/20 Quick! Our March G/20 tournament took place on March 7th, 2011. Thirteen players came prepared for some Quick action! We decided to run two sections, one rated and one unrated. The rated section saw four of the eight players tie at 2.0 points. Congratulations to Dennis Bourgerie, Jeff Smith, Jonathan Bonwell, and Shawn Rhoney! Jon Bonwell receives the plaque on tiebreak. 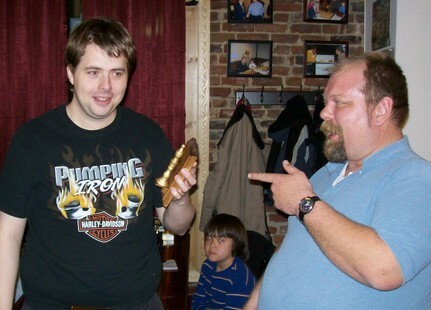 Jonathan Bonwell is presented the Chess Thing plaque by Darren Erickson. The unrated section saw L.T. Thompson go 2 for 2 and then take a third round bye. Congratulations L.T.!! The rated section has been submitted for rating. We will have crosstables for both events later this week – check back with this thread for more! Crosstable, Original Announcement, and TLA after the cut. With the conclusion of the club championship we return to our monthly rated schedule, and being the first Monday of the month it’s time for three rounds of G/20 in one evening! Check in by 7:20 to have a chance at the 1st Place homemade plaque featuring the coveted “Chess Thing,” to be presented on March 14th. On the other hand for those interested in the tournament, TLA and more information after the cut. The event will be held at Colley’s Chess Cafe. (Use the About and General Information link to the right for a map.) It is a 3 Round tournament (3 games per player in the tournament.) It will be a swiss system tournament, which is the most common type of chess tournament. Each player will have 20 minutes on their clock to play all their moves in each game, and each player will have a delay of 3 seconds on each move before the clock starts to count down. It is a United States Chess Federation Rated tournament, and therefore USCF membership (an additional expense if you’re not already a USCF member) is expected to participate – we can set you up on site for this. There is only one section – all participants will compete against each other. A homemade 1st Place Plaque will be presented to the overall winner on tiebreak. There is a $1.00 entry fee charged for the event – $1.00 total if you play all three rounds. If you have further questions you may call the Event’s Tournament Director, Dennis Bourgerie, at 309-454-3842. This entry was posted on Sunday, February 13th, 2011 at 12:26 pm	and is filed under All Pages, Events, Past Events. You can follow any responses to this entry through the RSS 2.0 feed. Both comments and pings are currently closed. Hey, Jon Bonwell looks good (you too Darren) in that picture. The pictures on the website are excellent!